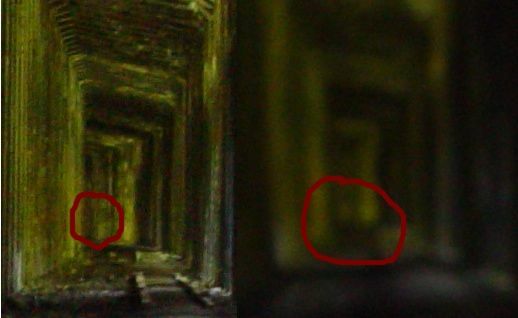 The photos below are significant in that we haven't found a logical explanation for them yet - and there may be one. Wonder why you don't see any orb photos? Learn more about orbs here. 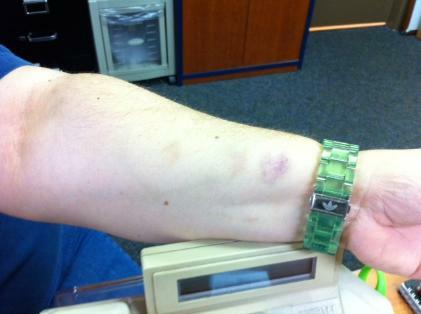 The photo to the right shows bruising to Patty's arm after a private residence paranormal investigation on 11/6/12. Patty explains she had no bruising going into the investigation. The next morning, the bruises were there. Patty can't recall any specific incident where she would have sustained the injury. During the investigation, Karen kept feeling someone touching her back, so the entities in the home were very likely making physical contact. Patty feels this type of contact could have led to the bruising on her forearm. The pattern of the bruises matches four fingers. 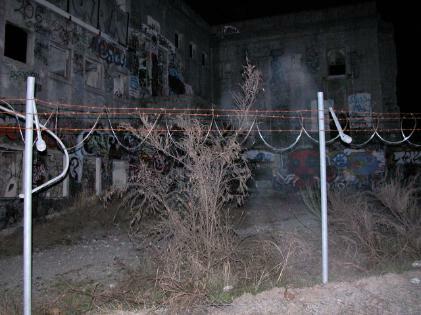 Patty captured the photos below at the Hill Ward at the Old Western State Hospital. 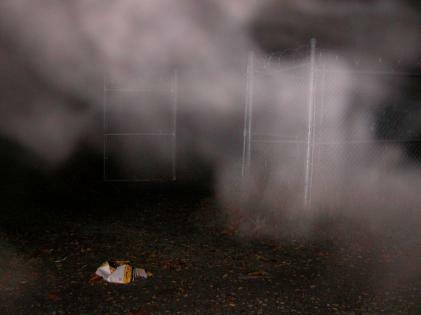 The camera was on a tripod, Patty was away from the camera and didn't exhale during the photo, and no one else was around to breathe and make a mist. The photo below may just look like a book lying on the ground, but there are a few things about this book that are quite interesting. 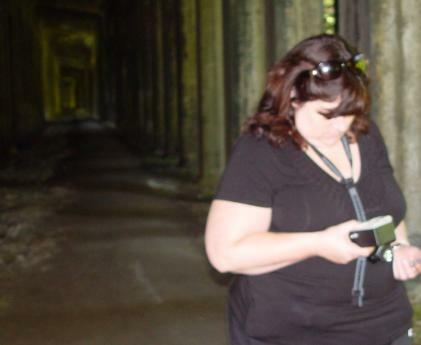 Karen was leading a ghost tour group in the attic of the Lewis County Historical Museum on Halloween weekend of 2011. The group was gathered in one portion of the attic when there was a loud thunk off to their right. Upon further examination, Karen discovered this book on the floor where it hadn't been just a minute before. 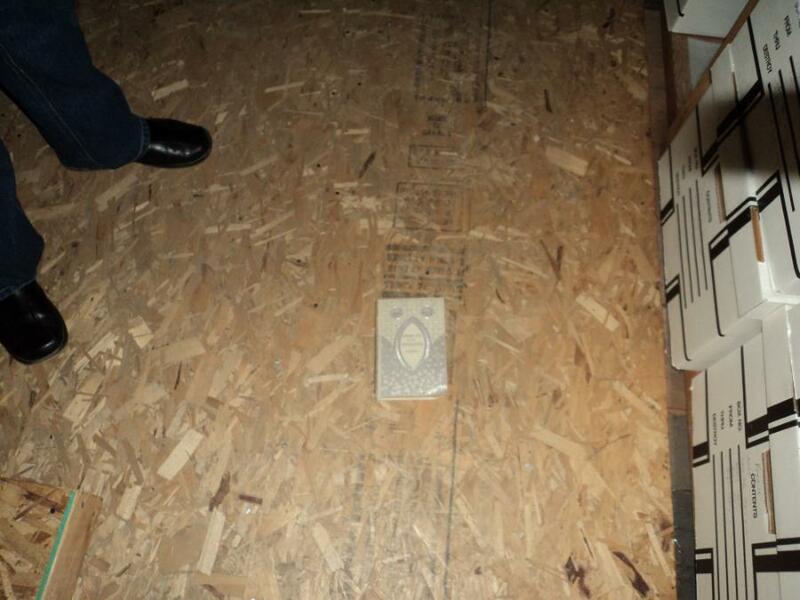 The books are kept on shelves in the other side of the attic, which means it had a way to travel to get to where it landed from an area where no one was at the time. The title of the book is Natural Law in the Spiritual World. Karen snapped a photo of the book where it landed before picking it up. There is a shadow in the lower left corner of the photo we've been unable to explain, since everyone was either behind or to the left of Karen and the flash as she took the photograph, and her camera didn't have a strap to get in the way of the flash. Later that same evening, SSPR had a similar experience with a pencil. Other objects that have flown through the air at the museum without anyone tossing them include another pencil, a pen and a hinge/hasp. Karen's son took the picture below of her at Wellington in 2009. The first picture is the entire photo. 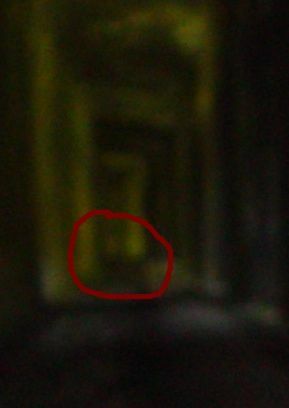 The second is a blowup of a glowing figure in the background. 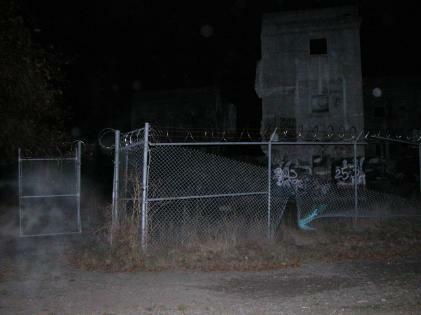 The third compares that blow up to a photo of the area behind Karen immediately before the glowing figure was captured. What's interesting is that the very moment Tanner snapped the picture, Karen stopped because she felt as if someone was following her.